Figs. 1, 1a. Desk-and-bookcase made by John Shearer (active c. 1798–at least 1818), Martinsburg, Virginia (now West Virginia), 1801–1806. Inscribed “Down with the Cropper of Ireland” and “Cropper is Repenting and his Master is Angry” in the top drawer of the case. Walnut, cherry, mulberry, yellow pine, and oak; height 8 feet 10 ⅛ inches, width 45, depth 24 ½ inches. A small fouled anchor is carved in the egg-and-dart cornice molding of the bookcase section. Museum of Early Southern Decorative Arts (MESDA) at Old Salem, Winston-Salem, North Carolina. 44 ½, width 43 ½, depth 21 ¾ inches. The feet have been replaced. Private collection; photograph by Gary E. Heimbuch. Figs. 3, 3a, 3b. Pier table made by Shearer, possibly Berkeley County, Virginia (now West Virginia), c. 1804–1806. Incised “By Shearer of Ednboro/Fame to Mars” and “Miss Elizabeth Filler/Fame to/ Virt.u,” respectively, in the inlaid urns at left and right. Walnut; height 29, width 39, depth 18 inches. Private collection; photographs by courtesy of MESDA. Figs. 4, 4a, 4b. Chest of drawers made by Shearer, Frederick County, Maryland, September 1809. Inscribed “Made to Miss Salome Kramer & payed for by me John Shearer Sept 1809”on the inside of the case. Incised “To Miss/Salome Krammer” in the inlay at center of top edge; and “by Shearer” in the second drawer inlay; incised in the inlays in the top drawer, left to right: “Death & Glory” in the oval above the drawer pull, “Colenwood,” “The Immortal/Lion/Ad Ld Nelson/Victory to the Great/Duke Charles of Austria/Ad Cochren,” and “Northesk” in the center, and “Glory & Death” in the oval above the right drawer pull. Walnut, oak, and poplar; height 38 ½, width 40, depth 24 inches. Private collection; Heimbuch photographs. Figs. 5, 5a. Chest of drawers made by Shearer, Frederick County, November 1809. Inscribed “Made by Shearer to Miss Christina Krammer of Fred. County Maryland, 1809” on the inside of the case. Incised “To Miss/Christina Krammer/Nov 1809” in the inlay at center of top edge; “The Federal/Knot” on the top drawer; “Britannia Rules/Rules the Main” on the second drawer; and “By Shearer” on the third drawer. Walnut, cherry, oak, and poplar; height 39, width 41, depth 23 inches. Colonial Williamsburg Foundation, Williamsburg, Virginia. Figs. 6, 6a. Fall-front desk made by Shearer, probably Loudoun County, 1818. Dated “1818” on the inside of the backboard; incised “Nemo me impune lacessit/by a true/North Britain” in the plaque below the urn inlaid on the fall board. Walnut, cherry, poplar, oak, and pine; height 46 ½, width 38, depth 22 inches. Collection of Linda Quynn Ross; MESDA photographs. Thirty years of genealogical research have turned up scant documentary information about the elusive joiner John Shearer, so the fifty-two surviving pieces of furniture signed by or attributed to him are left to tell his story. Many of his thirty-two case pieces feature bold pro-British inlays that make references to Vice Admiral Horatio Nelson, the Royal Navy, and Shearer’s Scottish heritage, exhibiting his political leanings and loyalism. However eccentric they may seem today, when the definition of “American” is quite clear, Shearer’s loyalties were not soThirty years of genealogical research have turned up scant documentary information about the elusive joiner John Shearer, so the fifty-two surviving pieces of furniture signed by or attributed to him are left to tell his story. Many of his thirty-two case pieces feature bold pro-British inlays that make references to Vice Admiral Horatio Nelson, the Royal Navy, and Shearer’s Scottish heritage, exhibiting his political leanings and loyalism. However eccentric they may seem today, when the definition of “American” is quite clear, Shearer’s loyalties were not so eccentric for the period. A look at his work will help to explain why. Despite writing “from Edinburgh 1775” on the interior of several of his pieces, there is no record of when or where Shearer was born or when he came to the United States. He was presumably born in Scotland between about 1760 and 1765, and was working as a joiner, probably on both houses and furniture in Martinsburg and around Berkeley County, Virginia (now West Virginia), about 1790. By 1809 he seems to have been living in Frederick County, Maryland, where he made chests of drawers for two sisters living there, and by 1810 he was working in Loudoun County, Virginia, where his last dated pieces—a desk and a table stand—were made in 1818. Shearer disappeared after 1818 and no other furniture or records of him have been found. From his inscriptions and inlay, it is clear that Shearer was extremely proud of his Scottish heritage and was strongly pro-British in the years surrounding the Napoleonic Wars and the War of 1812. His references indicate that he closely followed the Royal Navy’s exploits and seemingly ignored the volatile American political scene of the late eighteenth and early nineteenth centuries. His most likely sources of information were local newspapers, surviving issues of which permit us to correlate published news events with many of his inlays. His inlaid political expressions are probably related to the visual culture of caricature and satire that became popular in Great Britain by the 1760s. In the post-Revolutionary United States, politics were divisive, and lingering animosity toward the British made proclaiming oneself a loyalist risky. Yet the United States actually engaged in more trade with Great Britain than with any other country at this time. Merchants, manufacturers, and planters, whose economic well-being was tied to this trade, gravitated toward the Federalist Party and centralized government. Their opponents, the Jeffersonian Republicans feared centralized government and wanted the power in the hands of the state governments. During Shearer’s early career, Berkeley County politics began to shift from pro-Republican to strongly pro-Federalist. By 1788 while eastern Virginia was largely voting Jeffersonian Republican, Berkeley County and other western Virginia counties were voting Federalist.1 The establishment of the Berkeley Intelligencer, a Federalist-leaning newspaper, in Martinsburg in 1799, ensured that Federalist support grew in the region. When the Napoleonic Wars forced American political parties to take sides in the early nineteenth century, the Federalists became increasingly pro-British and the Republicans more pro-French. 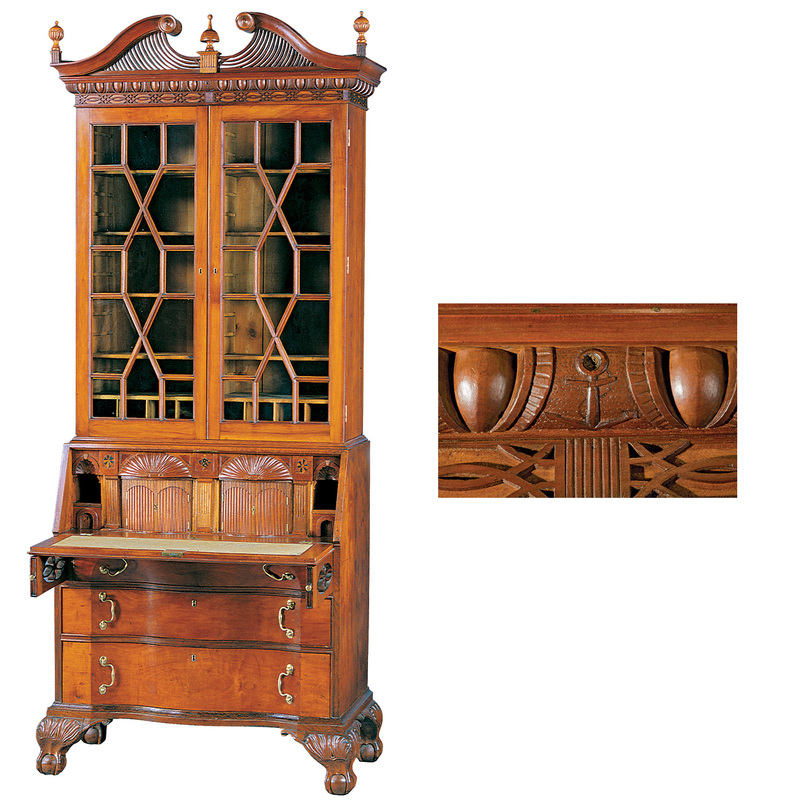 With this shift in politics Shearer’s inlay expressed increasingly bolder British loyalist sentiments, sentiments that must have also appealed to his customers.Shearer made the desk section of the desk-and-bookcase in Figure 1 in 1801 and added the bookcase in 1806. On the top drawer of the desk he inscribed a bold but hidden message, drawing a man being stabbed with a pitchfork by the devil and writing, “Down with the Cropper of Ireland” and “Cropper is Repenting, and his Master is Angry.” Sketch and inscriptions alike probably refer to the Irish Rebellion of 1798, during which Irish rebels sought parliamentary reform and religious freedom. But they were defeated by the English, and under the Act of Union of January 1801 Ireland was forced to send its representatives to the English Parliament. The rebellion itself was widely reported in the United States, including in articles in Martinsburg’s Potomak Guardian.2 One article recorded several verses from an Irish Protestant folk song that included the chorus “Down, down, croppies lie down,”3 using the derogatory term croppies for the Irish rebels, so named because they wore their hair cut short as a sign of unity with the revolutionary French government.4 Shearer surely meant “Croppy” when he wrote “Cropper” in his inscription. As an ardent loyalist, he would have been pleased to learn of Ireland’s forced union with England, and his inscription and drawing celebrate the political end of the rebellion. The 1806 bookcase section contains an early and subtle outward display of Shearer’s pride in the Royal Navy. Centered in the egg-and-dart cornice molding above a fretwork frieze is a carved anchor (Fig. 1a). As a Masonic symbol, the anchor represents “hope and a peaceful harbor for the weary,”5 and it was recognized as such even by non-Masons. But close examination reveals that this anchor is really a fouled anchor—one with a chain wrapped around it, an abomination to seamen everywhere, but a decorative motif that had been adopted as the symbol of the British Admiralty at the end of the sixteenth century.6 Since a fouled anchor may have been too blatant a symbol for Berkeley County in 1806, Shearer made the wrapping line very subtle so that he could still display his pride in Great Britain’s naval superiority while appearing to use the Masonic symbol of hope. Why was Shearer feeling so proud? Between 1797 and 1806, four important naval battles were fought that made Horatio Nelson a British hero and confirmed the Royal Navy as the most powerful in the world. Shearer would have been well aware of these battles because he could follow the events in the local newspapers, which often included the names of the ships in a fleet, as well as the number of their guns and, often, the names of their commanders. With the anchor in the cornice, Shearer was most likely alluding to the last major naval battle fought before the bookcase was made, the Battle of Trafalgar on October 21, 1805. Although Admiral Nelson was wounded in the battle and died later that day, his ships defeated the combined French and Spanish fleets and established British naval supremacy for the next hundred years. American newspapers followed the British naval exploits closely. The names of both Nelson and his second-in-command during the battle, Vice Admiral Cuthbert Collingwood, first appeared in Martinsburg’s Berkeley and Jefferson County Intelligencer on July 12, 1805, which reported that they were probably in the West Indies. News of the fleet’s activities continued to be reported throughout the summer and fall. When news of Nelson’s death finally reached Martinsburg, the publisher put out an unusual one-sheet special edition with all of the details on December 25, 1805. The pier table in Figure 3 is another example of Shearer’s use of double meanings in his inlay. Flanking a pierced “Federal knot” on the front apron are inlaid memorial urns with central winged heads (Figs. 3a, 3b). The proper right urn is incised “By Shearer of Ednboro/Fame to Mars” and the proper left, “Miss Elizabeth Filler/Fame to Virt.u.” Mars could refer to the Roman god of war; such a reference would not be unusual in neoclassical design. But it probably also refers to the Royal Navy ship Mars, which participated in the Battle of Trafalgar and had appeared in a list of ships and their commanders in the Intelligencer on July 12, 1805. Shearer may have wanted non-loyalists to think that “Virt.u” referred to Elizabeth Filler’s virtue, and it may well have, but his other intent was likely a reference to the French frigate Vertu, which had been captured off Cap Français, Saint Domingue (now Haiti), on November 30, 1803.7 In May 1803 Great Britain and France had renewed their war. On July 29 the Intelligencer reported that the French military commander on Cap Français was concerned that his supplies were going to be cut off by the blockading British. His troops had been battling Haitian rebels for control of the island and were holed up in Fort Vertières, and apparently his fears were justified. On November 18 the rebels attacked the fort and defeated the French, but allowed them to retreat to their ships with the understanding that they would leave within ten days. However, the blockading British prevented them from doing so. Trapped between the rebels, who would sink their ships and massacre them if they did not leave, and the blockading British, the French surrendered to the British. On January 20, 1804, Bartgis’s Republican Gazette in Frederick Town, Maryland, reported that the French frigates Surveillante and Vertu, both with forty-four guns, and the British corvette Discovery had arrived at Port Royal in southeastern Jamaica. The English commandeered Vertu and left the French in Jamaica.8 Shearer would have cheered any defeat of the French, and he used Vertu’s name on his pier table around the same time that he would have learned of these events. Shearer inlaid fouled anchors above the top drawer pulls (Fig. 4b) and incised “Death and Glory” above the one on the proper left and “Glory and Death” above that on the proper right. Together, they indicate that it was not a simple choice of death or victory. The chest of drawers (Fig. 5) made for Salome Kramer’s sister Christina is incised with a lion rampant in the inlay on the middle drawer, a symbol of Great Britain (Fig. 5a), along with the inscriptions “Britannia Rules” and “Rules the Main” on banners above. As Britannia is the Latin name for Great Britain, Shearer could have been referring generally to Britain’s naval successes. However, he is probably referring specifically to the Royal Navy ship Britannia, which was engaged in both the Battle of Cape Saint Vincent in 1797 and the Battle of Trafalgar, during which she was Lord Northesk’s flagship.16 Indeed, reference to Northesk nicely links the two sisters’ chests together—though it does raise the question of why German Americans would have chests with such blatant British loyalist proclamations on the front. Perhaps simply because British goods were fashionable at the time, the symbolism did not seem as odd as it does today. The desk in Figure 6, one of Shearer’s last known dated pieces, demonstrates his dual loyalty by including both the Royal Navy’s fouled anchors and a thistle, the national em-blem of Scotland. The plaque below the urn on the fall board is incised with the Latin motto of the Order of the Thistle, an ancient Scottish chivalric order revived by Queen Anne in 1703, and the highest honor bestowed by Scotland: Nemo me impune lacessit (No one harms me with impunity).17 The incised thistle above the urn refers to both the order and to Shearer himself, who further proclaims his Scottish pride, adding “by a true North Britain” beneath the motto. Shearer’s furniture clearly indicates his allegiances to Britain, the Royal Navy, and to Scotland, although few other verifiable facts about his life have come to light. It is clear that he would have been able to obtain much of his information about current events from local newspapers, but he almost certainly had other sources as well, such as fellow tavern patrons, letters from family or friends, and his own travels in the area. He was probably influenced by the political caricatures he saw, and, like a caricaturist, responded to the current events he read about in newspapers through his inscriptions and inlay. Having arrived in the United States soon after the end of the American Revolution, he worked during a period of strident domestic politics. Our developing nation was drawn into the wars of European powers and nearly went bankrupt. Despite this, many Anglo-Americans remained connected to their British roots as late as 1815 and followed the cultural and current events of their day closely. Shearer’s inscriptions are not as eccentric as once thought by scholars, but reflect a craftsman in tune with his customers and their shared environment.I would like to thank Gary E. Heimbuch, John J. Snyder Jr., Melody Warner, Oscar P. Fitzgerald, Patrick Sheary, Susan Conway, Tara Gleason Chicirda, Cynthia Attwood, and the staff at the Museum of Early Southern Decorative Arts for their assistance in the preparation of this article. ELIZABETH A. DAVISON is an independent scholar who is currently working on a book to accompany a traveling exhibition about Shearer scheduled to open at the DAR Museum in Washington this fall. 1 The Early American Party System, ed. Norman K. Risjord (Harper and Row, New York, 1969), p. 63. 2 Potomak Guardian (Martinsburg), August 22, p. 2, and August 29, 1798, p. 1; September 5, 1798, p. 2; September 19, 1798, p. 3; October 3, 1798, p. 1; November 7, 1798, p. 1. 3 Ibid., December 12, 1798, p. 4. see http://en.wikipedia.org/wiki/Croppies_Lie_Down (accessed February 11, 2008). Thanks to Mary Ronan for this reference. 4 The Irish rebels were in touch with the revolutionary French government. A French fleet carrying fifteen thousand troops attempted an invasion of Ireland in 1796, but due to bad weather and poor seamanship, the invasion failed. 5 [Barbara Franco], Masonic Symbols in American Decorative Arts (Scottish Rite Masonic Museum of Our National Heritage, Lexington, Massachusetts, 1976), p. 47. 6 The symbol was also adopted by the United States Navy. 7 The Vertu was commandeered by the Royal Navy until December 1810; see J. J. Colledge, Ships of the Royal Navy: An Historical Index. Volume I, Major Ships (Augustus M. Kelley, New York, 1969), p. 596. 8 Bartgis’s Republican Gazette (Frederick Town, Maryland), January 20, 1804, p. 3. 9 Robert Holden Mackenzie, The Trafalgar Roll, Containing the Names and Services of all Officers of the Royal Navy and the Royal Marines who participated in the Glorious Victory of the 21st October 1805, together with a History of the Ships engaged in the Battle (George Allen and Company, London, 1913), pp. 58–59. 11 Christina Kramer’s’s birth date was provided by a family descendant, Martha Suddarth, e-mail to the author, December 31, 2009. 12 Frederick-Town Herald, September 2, 1809, p. 3. 13 Bernard Ireland, Naval Warfare in the Age of Sail—War at Sea 1756–1815 (W. W. Norton, New York, 2000), p. 176. After the Battle of Trafalgar, Collingwood and his fleet remained in the Mediterranean, and his exploits were published regularly in the newspapers. 14 Mackenzie, The Trafalgar Roll, p. 38. 15 Berkeley and Jefferson Intelligencer, March 11, 1806, p. 3. 16 Mackenzie, The Trafalgar Roll, p.36. 17 The Knights of the Thistle are ranked in precedence just below the Knights of the Garter, the two oldest and most honored orders in Britain.